Transportation is about to get a technology-driven reboot. 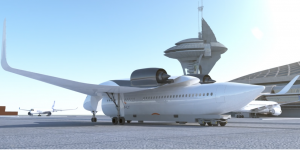 Recently, Akka Technologies, an innovative engineering and consulting company based in France, unveiled its mind-blowing Link & Fly aircraft design. The new vehicle is both a flying train that can take to the air and a plane with a passenger pod and detachable wings that can travel on the ground via tracks. Akka’s Link & Fly concept craft will be 33.8 meters long and 8.2 meters high, with a 48.8-meter wingspan. With Akka’s futuristic concept, when you need to fly, you will take a tube-shaped passenger train that will bring you straight to the airport. At the airport, the passenger pod will then roll onto the runway, where the pod will attach to the wings, which sit waiting with the engines on top. Upon landing, the plane detaches from its wings and turns back into a train, which rolls on tracks to local train stations. The craft is planned to have a maximum cruise altitude of 39,800 feet, a range of 2,200 kilometers, and a cruise speed of Mach 0.78 (around 600 miles per hour).